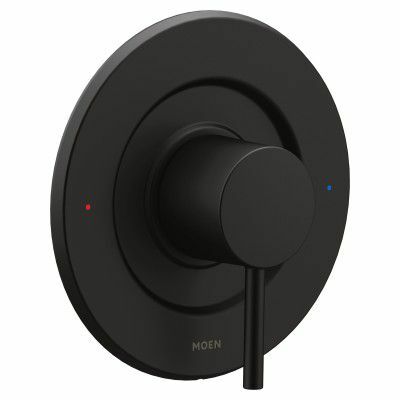 The Chateau 1-Handle Tub and Shower Faucet PosiTemp Trim Kit from MOEN combines durability with affordability to polish off your bathroom buildout with brushed chrome pieces that coordinate with any decor style. A single-handle lever rotates 270 degrees to adjust water temperature, held steady by a compatible PosiTemp valve to keep flow at your preferred heat intensity. Part of the M-PACT common valve system, this package makes it easy to substitute the trim without tweaking the plumbing should your future style preference change. The accompanying 2-5/8 in. diameter single-function showerhead dispenses water at 2.5 GPM for generous rinsing and cleansing throughput, pairing with the 5-1/2 in. tub spout to make a superb combination. This kit requires MOEN valve 2510, 2520, 2570 or 2590 (not included) to complete installation. Align Single-Handle Posi-Temp Shower Faucet Trim Kit in Matte Black (Valve Sold Separately) From large, open master baths to minimalist powder rooms, Align faucets and accessories bring a refreshed modern look to your home with simple lines and contemporary style. Align Single-Handle Posi-Temp Shower Faucet Trim Kit in Matte Black (Valve Sold Separately) is rated 4.8 out of 5 by 5. Rated 4 out of 5 by Alan from Good unit, looks great. Only reason for giving it 4... Good unit, looks great. Only reason for giving it 4 starts instead of 5 was the price. I don't understand why the black color makes it 3 times the price of a chrome one! Really irritating to pay over $170 for a trim kit! Rated 5 out of 5 by TimL from Good fit and finish. It's just beautiful. Good fit and finish. It's just beautiful. Rated 5 out of 5 by Christi from Easy to use and looks nice.... Easy to use and looks nice. Rated 5 out of 5 by JMS from Excellent product, well made and does not look cheaply made. The installation was a breeze. Excellent product, well made and does not look cheaply made. The installation was a breeze.